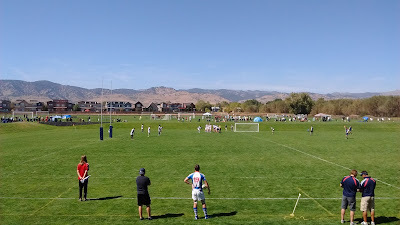 At a sunny and warming midday, Boulder and Glendale, a brace of heavyweight Division-2 XVs, got after the pill on arguably the finest ground in the state, PleasantView Rugby Field in the northeast section of the college town. A full and fractious 80 minutes and 10 touch downs after field magistrate Chris Huff’s initial signal, the victors had a five-point celebration to attend, though a wonky cumulative goalkicking effort at one-from-eleven saw 21 points scatter. Both sides exchanging turnover ball at breakdown initially, and much industry displayed at that phase by each. Short, pounding, pick-and-goes established forward movement for the home team, though offside and layabout penalties stymied Boulder progress, while uncharacteristic mishandles plagued Glendale. With Boulder running from their own end, outside center Jake Davis broke the line at his own 22 and powered into Raptors territory before offloading to flyer, Roland Wheeler, who sliced into the 22 before being brought to ground. Back across the pitch in fast, frenetic phases until homeboys openside flanker, Jacob Celemajar, made space for Zach Hendricks to cross in the corner for the halfback’s grounding and first blood to the hosts and a five pointer for their efforts: Boulder up, 5-nil after 18 minutes. 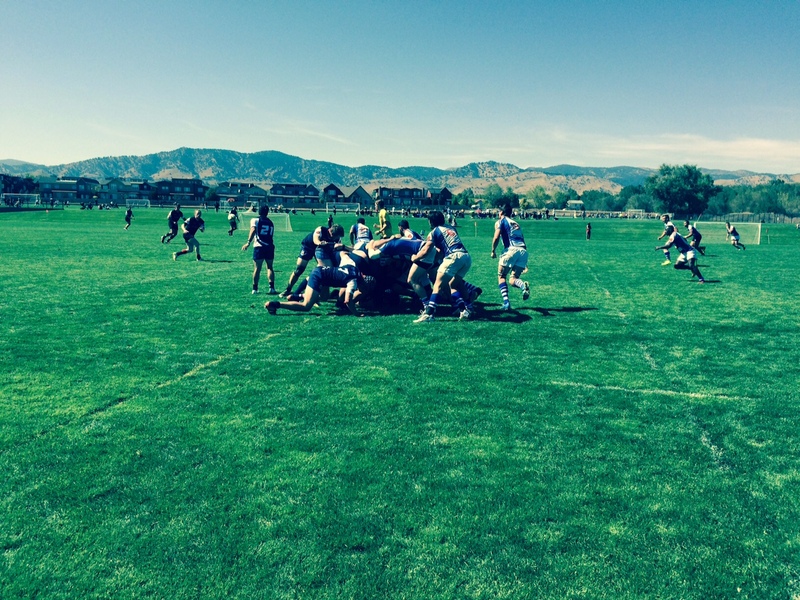 Five ticks onward and a second fiver for Boulder after better effect at breakdown produced possession and 8man, Joe Sawicki, crashed through Glendale’s goaline defense for the try that made the tallies 10 and 0. Glendale were not lost for opportunity as hard, lengthy charges by center Cody Melphy and winger Dewon Reed made for deep penetration inside Boulder’s 22, but failure-to-release ball at tackle penalties transferred possession. Raptors would get their taste after a fiery scintillator along nearside touch by Reed setup wing partner, Tony Gobern, for Gobern’s crossing that meant 10-5 to Boulder after 31 minutes of action. Penalty count in Glendale’s favor just now in the last ten minutes of the first forty, but no further closings by the predators. Boulder were able to count another score before the mid-match break, this handful touched down by their fullback, and lads to lockers for hydration and instruction with 15-5 tallies at Huff’s halftime tweet. Boulder were more successfully consistent with linebreaks from their backline with flyhalf Sean Kilfoyle (TRY League, Denver East, CU product) mixing things up well with cutouts, lengthy skips and cheeky lookers keeping the Raptors honest, while Glendale were the beneficiaries of their hosts repeated indiscretions about the breakdown and employed constant threat from an ever-ready and talented threequartersline. 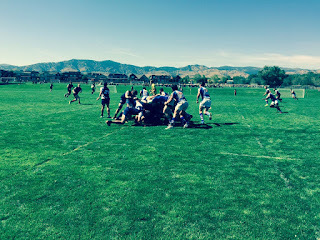 Kilfoyle’s pop overtop of scrum was collected and touched-down by wing Jake Shomer after a high carom off the ground; Boulder 20 and Glendale 5 in the 42nd minute. Blindside Paul Rohr split tacklers to space at midfield and freed Wheeler at Raptors 10 meter line for a swift scamper along touch for Wheeler’s corner dot and 25-5 for Boulder in the 51st minute. One try more for the homeside at the hour mark with engine roomee Skylar Cook crashing into goal from seven meters out and 30-5 now. Glendale’s swift reply had Reed breaking at midfield to put his fullback, Tian Kok, clear for a flipper-assisted grounding: 30-10 at 61’. Shout to Rohr from breakdown 10 meters out the Glendale goal and slick transfer to backrow lock Sawicki for the 8man’s grounding: 35-10 for Boulder just now. Last numbers to the travelers as Reed’s cut-out had replacement back, Nathan Faamatuainu, in space to touchdown the match’s final try; and with Reed taking over goalkicking duties, the elusive sticksplitter was at last accomplished for five-made-seven, and tallies of 35-17 at 77’. 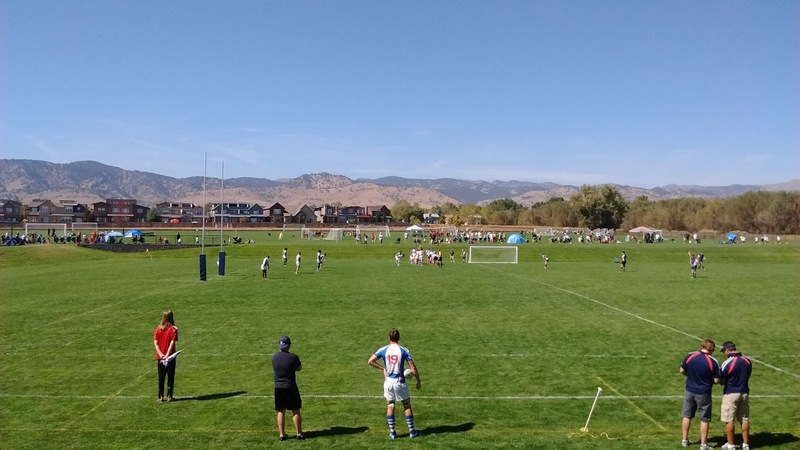 That was the record with Huff’s last blast bringing an end to a very physical and action-packed 80 minutes of rugby in Boulder on Saturday, the rugby day.